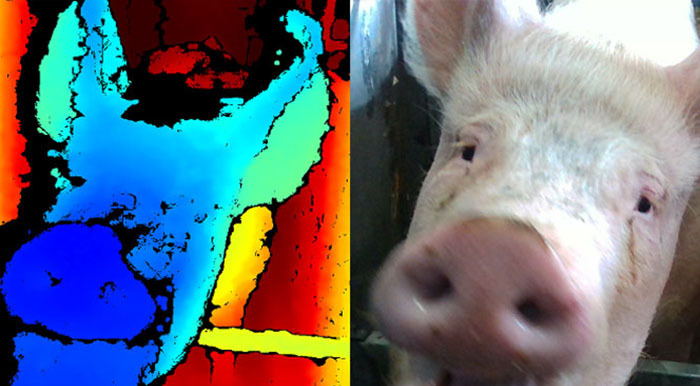 Animal behaviourists from Scotland’s Rural College in Edinburgh have teamed up with machine vision experts at the University of the West of England (UWE Bristol) to use facial recognition technology in an attempt to detect different emotional states in pigs. It is hoped that the study will lead to a tool that can monitor individual animals’ faces and alert farmers to any health and welfare problems. Pigs are highly expressive and SRUC researchhas previously shown they can signal their intentions to other pigs using different facial expressions. There is also evidence of different expressions when they are in pain or under stress. At SRUC’s Pig Research Centrein Midlothian, scientists are capturing 3D and 2D facial images of the breeding sow population under various, typical commercial situations that are likely to result in different emotional states. For example, sows can experience lameness and could show different facial expressions relating to pain before and after being given pain relief. Dr Emma Baxterfrom SRUC said: “Early identification of pig health issues gives farmers the potential to improve animal wellbeing by tackling any problems quickly and implementing tailored treatment for individuals. This will reduce production costs by preventing impact of health issues on performance. The study is being funded by the Biotechnology and Biological Sciences Research Council (BBSRC) and is also being supported by industry stakeholders JSR Genetics and Garth Pig Practice, as well as precision livestock specialists Agsenze.